This is easily my favourite cook book of all time. 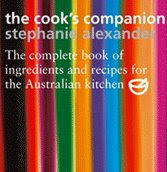 Stephanie Alexander's "The Cook's Companion" is as much a resource to learn about about food, as it is a recipe book. It is particularly good for Australian cooks, as it is specific to our seasons and produce. It is not an encyclopedia of food, but it is an amazing collection of vital information for anyone serious about cooking great dishes. The book is organised in order of indredients. For example, if you wanted to cook a lamb dish, go to the lamb section and Stephanie talks about seasons, cuts of meat, ways to cook different cuts, foods and flavours that complement the ingredient etc. Oh, how many pages should I reference? This is THE book on ingredients & a must for every kitchen. We have recipe's from here that have folklore status amongst friends and family. In fact, they have become request items when friends come for dinner.